Before you consider more in depth the qualifications and distinctions, please notice that the results are not saying all about a cat. Of course the titles and the qualifications a cat has been award aprove the standard of the cat, but that shall also be compared with how many shows the cat has been on and the concurrence at the show. It says nothing about the standard of the cat compared with a cat not so frequently exposed or a cat not exposed. Some cats are lovely and faithful companiens at home but hate expositions; if the owner have the sensibility to listen to the cat, that cat will be excused for going to show. For truly - it is more we their owners then the cats who love expositions! 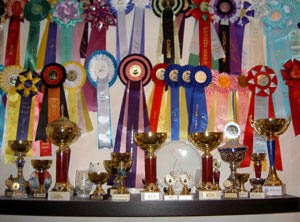 But sure it''s awesome when your lovely cat has been award their certificates, titles or has been Best In Show! But let us still rember that there is a lot of beautiful cats who has never got titles or never been in question for World Winner etc, We like to be on show sometimes with the cats who find showing ok. When our males are becoming fertile and sensible for all smells at show (there is a lot of girls on show) we let them take a break. Other cats have declared that they don't like to be on show or are afraid (expositions are not a natural environment for a cat) then we stop for a while and try again later. Some realy don't like to be on show - then this cat stays at home. All our cats have the highest title they can get: mam and dads cosy cat! 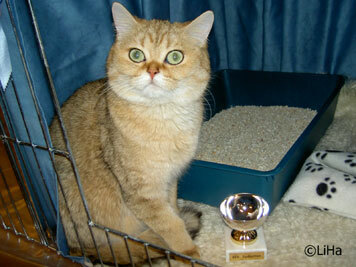 Champion are called the title for fertile cats and Premier for neuter. MAX POINTS for all races is 100 for the standard at FIFE.